The single species, M. avellanarius, occurs from France and southern Sweden to the European part of Russia and northern Asia Minor, as well as in southern Great Britain, Sicily, and Corfu (Corbet 1978). Head and body length is 60-90 mm, tail length is 55-75 mm, and weight is 15-40 grams (Van Den Brink 1968). The general coloration of the upper parts is rich yellowish brown or yellowish red. The throat and chest are creamy white, and the belly is pinkish buff. The well-haired tail is brownish above and paler below. The snout is blunt, the eyes are large, and the ears are relatively small. Females have eight mammae (Ognev 1963). 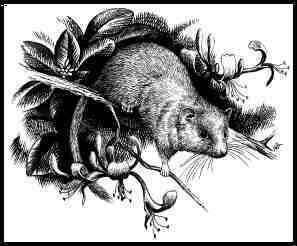 The common dormouse dwells in thickets and in forests with an abundance of secondary growth. It is arboreal and scrambles about with great agility but does not usually ascend as high into the trees as does Myoxus. The common dormouse is nocturnal and crepuscular, sleeping by day in a globular nest constructed of shredded bark, leaves, grass, or moss and located in a bush or the lower branches of a tree. The nest is usually about 1-2 meters above the ground (Grzimek 1975). The nest of an individual animal is 60-80 mm in diameter; the nest of a female with young is more extensively lined and measures about 120 mm in diameter. Winter hibernation is spent in another nest, located in a burrow, in a stump, or on the ground beneath moss, leaves, and other debris. This nest is constructed of vegetation and is bound together with a sticky secretion from the salivary glands. The period of dormancy may begin as early as August and extend to May in Russia (Ognev 1963). In England this period lasts from late October to early April. Apparently, hibernation is triggered when the external temperature falls below 16' C. During deepest dormancy the blood temperature of Muscardinus falls to 0.25'-0.50' C, whereas its normal temperature is 34'-36' C.
The common dormouse appears to be associated with nut-bearing trees, and hazelnuts are known to be an important part of its diet (Grzimek 1975; Ognev 1963). Nonetheless, one observer considered Muscardinus to be just as incapable as other small rodents of opening hard hazelnuts. Muscardinus is able to gnaw a hole in fresh nuts, thereby getting the seed out in little pieces. Its diet also includes other seeds, buds, berries, insects, and possibly birds' eggs and nestlings. Some food may be stored during the summer and utilized during brief periods of winter arousal. Niethammer (in Grzimek 1990) listed population densities of 0.1-3.5/ha. Van Den Brink (1968) wrote that Muscardinus sometimes lives in small colonies. It is not as vocal as Myoxus but does produce soft chirping and whistling sounds. Ognev (1963) stated that young had been found from June to mid-October, that there are probably at least two litters per year, and that litter size is 3-5 young. In a study in Moravia, Gaisler, Holas, and Homolka (1976) learned that there was usually only one annual litter, occasionally two; that average litter size was 4.7 young; and that the young normally bred after their first hibernation but rarely bred in their first summer of life at only 2.5 months. According to Corbet and Southern (1977), birth peaks occur in Europe from June to early July and from late July to early August, the gestation period is 22-24 days, litters contain 2-7 young, the young open their eyes after I8 days, independence is attained at 40 days, and maximum known longevity is 4 years in the wild and 6 years in captivity. Pucek (1989) indicated that Muscardinus has become rare in much of its range because of destruction of forest habitat. it now receives full legal protection in most countries where it occurs. Amori, Cantini, and Rota (1995) noted that it has been affected particularly by loss of lowland forests, replacement of deciduous by coniferous woodland, careless rodent control and use of pesticides, and potential genetic deterioration through artificial isolation of populations. It is designated as near threatened by the IUCN.